That was looking west on Apalachee Parkway, approaching Monroe Street. US 19 probably began to the right for about one year, but in 1930 the route was extended down to St. Petersburg. So it is debatable whether that endpoint was located there long enough to ever be signed as such. 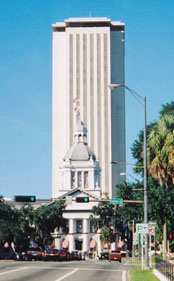 US 319 was commissioned in 1933, with its north end in Tallahassee. It probably began to the left on Monroe, but that lasted only a few years: in 1937 US 319 was extended north to Thomasville GA.
That was on northbound Monroe at Tennessee Street, or US 90. Today that is all US 27, but for about 12 years, the south beginning of US 27 may have been straight ahead. 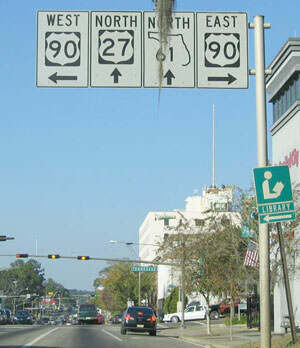 ​​​ In 1946, US 27 was extended south to its current endpoint, and since then, no US routes terminate in Tallahassee.